How to calculate Minimum Bar Spacing for Bundle Bars in Cast-in Place Concrete as per AASHTO provisions. 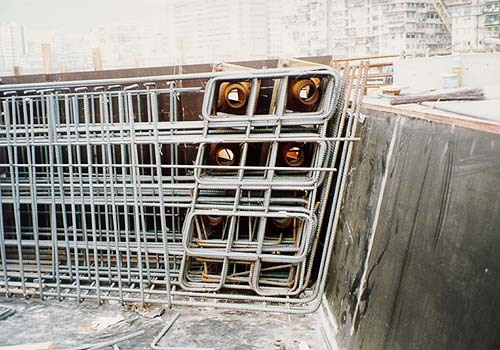 As per AASHTO LRFD, section 5.10 the minimum bar spacing for bundled bars shall be calculated based on the derived diameter instead of calculating from individual diameters. For example if we are using 2 nos. 32 mm dia bars, the equivalent diameter corresponding to 2×32 is 45mm. Hence, 45 should be used to apply the following clauses from AASHTO. For 2×32 dia bars, clear spacing will be ~68mm for Cast-in Place concrete and 60mm for precast concrete. 5 times the maximum size of the coarse aggregate, or 1.5 in. 33 times the maximum size of the coarse aggregate, or 1.0 in. The number of parallel reinforcing bars bundled in contact to act as a unit shall not exceed four in any one bundle, except that in flexural members, the number of bars larger than No. 11 shall not exceed two in any one bundle. Bundled bars shall be enclosed within stirrups or ties. Individual bars in a bundle, cut off within the span of a member, shall be terminated at different points with at least a 40-bar diameter stagger. Where spacing limitations are based on bar size, a unit of bundled bars shall be treated as a single bar of a diameter derived from the equivalent total area.